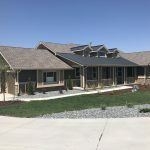 In celebration of the Home Builders Association of Metro Denver’s 75th anniversary, the 2018 Denver Parade of Homes features 75 professionally designed model homes and custom homes. Of the 75 homes showcased in this year’s Parade, five are luxury Dream Homes. 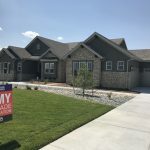 With prices ranging from $950,000 to $2,129,950, this year’s Dream Homes are located in Denver, Franktown, Lone Tree, Parker, and Windsor. One spotlight community is showcased in the Parade, Whispering Pines. Nestled on the northern edge of the Black Forest this community is for those seeking an authentic, serene and uniquely Colorado setting. Twenty-three local builders are participating in this year’s Parade. They include Berkeley Homes, BLVDWAY Communities, Brookfield Residential, CalAtlantic Homes, Camerata Homes, Cardel Homes, Century Communities, David Weekley Homes, Dream Finders Homes, Epic Homes, JUMA Homes, KB Home, Koelbel & Company, Lennar, Lokal Homes, Meritage Homes, Oakwood Homes, Richmond American Homes, Shea Homes, Taylor Morrison, Toll Brothers, TRI Pointe Homes, and William Lyon Homes. 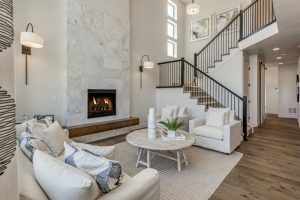 Parade homes are located in new and established communities in 23 metropolitan Denver cities from Timnath to Castle Rock and Arvada to Aurora, as well as neighboring communities in Fraser and Granby. Parade homes base prices range from an attainable $299,000 to $2,129,950. 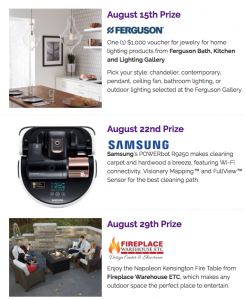 The #MyParadeInspiration social contest, held during the Parade, features three grand prizes valued at no less than $1,000 provided by our contest sponsors, Ferguson Bath, Kitchen and Lighting Gallery, Samsung and Fireplace Warehouse ETC. It’s easy to enter, click here to learn more. 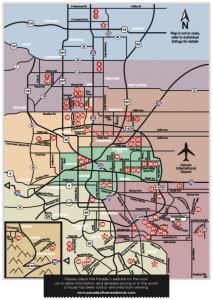 The 2018 Denver Parade of Homes is held on Thursdays, Fridays, Saturdays, and Sundays from August 9 through August 26, 2018. Parade homes are open to tour from 11 a.m. until 6 p.m.